Are Palm Oil & Coconut Oil the Same? How Much Oil Should You Eat? A naturally produced fat-like substance that is found in your cell walls, cholesterol is needed for your body to function properly. However, too much cholesterol can increase your risks of heart disease and stroke. Heart-healthy diets, such as the Mediterranean diet, that are rich in whole grains, lean-proteins, fruits, vegetables and healthy fats can decrease these risks. Olives and olive oil, a mainstay in the Mediterranean diet, have numerous heart healthy benefits. Cholesterol is transported through the body by lipoproteins. Low-density lipoproteins, or LDL, are considered bad cholesterol since they carry cholesterol to the arteries and blood cells. High-density lipoproteins, or HDL, are often referred to as good cholesterol because they transport cholesterol away from the arteries and filter it out of the body through the liver. Although total cholesterol levels and LDL levels should be low, higher levels of HDL are desirable. The nutrients in foods such as olives have been known to lower total blood cholesterol and LDL levels while increasing or maintaining HDL levels. The Mediterranean diet refers to the dietary patterns of the countries bordering the Mediterranean sea. This diet is characterized by a high consumption of fruits, vegetables, whole grains, beans, nuts, seeds, healthy fats, spices and the occasional glass of wine. The Mediterranean diet tends to limit the intake of unhealthy fats and has been known to reduce the risk of heart disease. It is also associated with a reduced risk of fatal heart attacks, cancers and both Parkinson’s and Alzheimer’s disease. 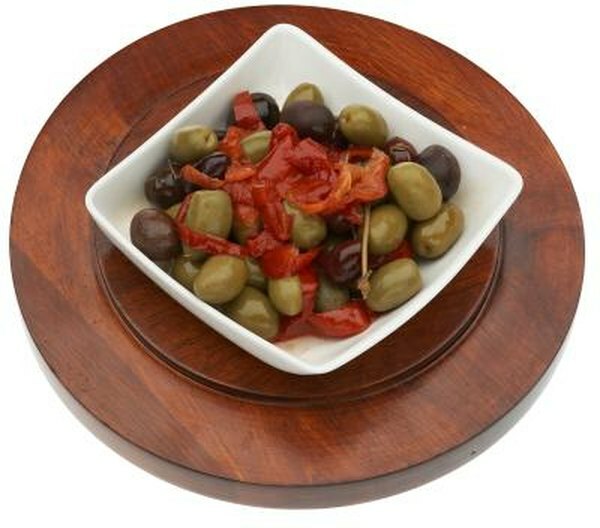 Olives are a staple in the Mediterranean diet and its main source of fat. Olives are a rich source of monounsaturated and polyunsaturated fats. Unsaturated fats are heart-healthy fats that are typically liquid at room and refrigerator temperatures. The abundance of monounsaturated fats found in olives can actually lower LDL levels and increase HDL levels. Along with monounsaturated fats and polyunsaturated fats, olives also contain linolenic acid, an omega-3 fatty acid and important antioxidant that can lower triglycerides, decrease the risks of blood clots, moderate blood pressure, improve vascular health and decrease the risk of sudden heart attacks. Like olives, olive oils are a healthy source of monounsaturated fats. Furthermore, unlike other oils, olive oils do not need to undergo chemical processing. Extra-virgin and virgin-olive oils are the least processed forms of olive oil and contain many of the natural flavors, vitamins, minerals, antioxidants and other nutrients found in ripe olive fruits. Like most fats, olive oil contains a large number of calories. However, because of its tendency to lower cholesterol levels, olive oil is a healthier alternative to saturated fats like butter, palm oil and certain vegetable oils. The daily recommended intake of cholesterol is less than 300 mg for people with normal LDL levels and less than 200 mg of cholesterol for those with high LDL levels. The Food and Drug Administration recommends using about 2 tablespoons of olive oil a day in place of other fats to reap the heart-healthy benefits of olives. Olive oil can be used as a substitute for butter for basting meats and sautéing vegetables, or as a dip for bread. It can also be used as a marinade or dressing. However, because olive oil is a high-calorie food, it should be consumed in moderation. Olives101.com: Will Olive Oil Raise Cholesterol? Are Avocados High in Cholesterol? Is Peanut Butter Bad If You Have High Cholesterol?